We would like to extend our deepest condolences for those who lost their lives in the Nepal earthquake and express our sincere sympathy to all the affected people. 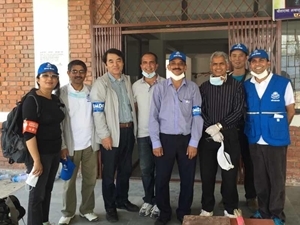 AMDA, AMDA Nepal and our partners will put our best possible effort to the relief activities for the affected people in Nepal with the message "AMDA never forget about you." We sincerely pray for the early recovery and reconstruction and beyond for Nepali people.